Well this week has been rather hectic but still I managed to get another heat pack made. This time it is my zany Zara Zebra. Things don't always go according to plan. 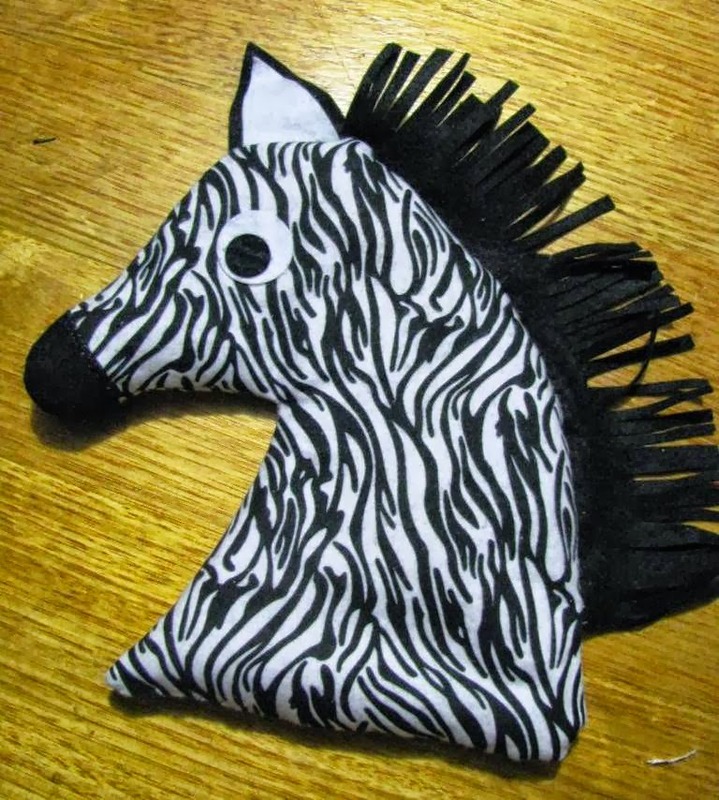 This cute zebra wasn't meant to be a heat pack. 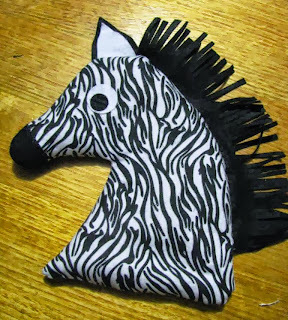 I was aiming at making a hobby horse type zebra with this printed flannelette material I had pick up in the remnant pile from my local Spotlight store. I designed it, cut it out and sewed it up. But when I went to stuff it, it just didn't look big enough. By the time I had rounded it out the head appeared too small for the broom stick. Bummer! But I can't waste it completely, so I thought I'd fill it with 2 cups of rice and turn it into a heat pack! So now it can join the other heat pack owls I made here. I cut the material to my own pattern. Out of some felt, I cut a strip of black approx 10cm (4 inches) wide and 22cm (8.5inches) long and cut a fringe along one edge. I cut two black circles and 2 white circles for the eyes. I also cut 2 sort of triangles in black for the ears and 2 smaller white triangles for the inner ears. The ears and mane were placed along the seam line between the main fabric and sewn into place at the same time as doing the main seam, leaving about a 3cm (1 inch) gap at the bottom. I used a funnel to direct 2 cups of rice inside the zebra. The sewing the opening closed with a whip stitch. Ta da! It is finished. Do you prefer the owls or the zebra? but first I really want to conquer the hobby horse for my granddaughters!! !